This is a sponsored post written by me on behalf of iHerb. All opinions are 100% my own. I wasn’t always a dental hygiene fanatic. In fact, I used to balk at people who flossed daily (who’s got time for that?). But here I am in my thirties and there’s nothing I love more than getting in my PJs, standing in front of the bathroom sink and flossing all my troubles away. Yes, daily! It’s the ultimate form of self-care and it leaves me feeling like a giddy school girl (with clean teeth to boot). But unlike other beauty and skincare products, our dental products are often the last thing we look at for toxic chemicals, hormone disruptors and wasteful packaging. 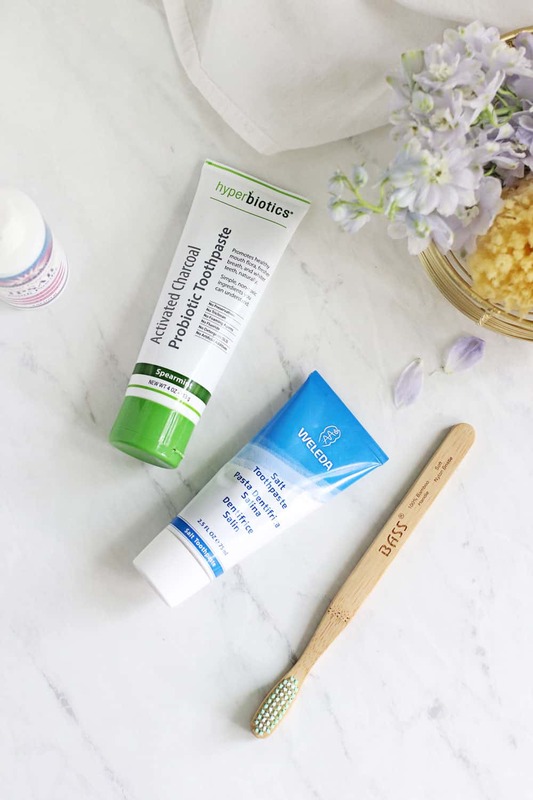 Having recently tackled my makeup bag and medicine cabinet, I set out to examine all the dental products I was using. I wanted to make better choices, not just for my body but for the environment as well. 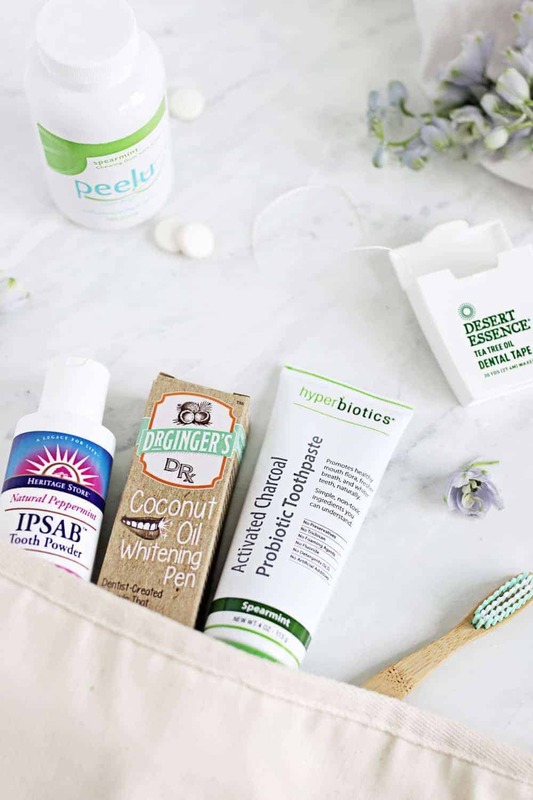 Not knowing where to start, I went to iHerb to dip my toes into the world of holistic oral care. Like an online natural superstore, iHerb carries over 1,200 brands and 30,000 natural products – with prices about 30-50% less than other stores. They have everything from natural toothpaste and mouthwash to eco-friendly toothbrushes. Things I didn’t even know I was looking for but am so giddy I found. And thanks to free shipping on orders over $20 and a 5% loyalty credit toward your next order, they make switching to green products a no-brainer. Here’s how I overhauled my daily brushing and flossing routine and went completely green. Bamboo Toothbrush // I always dismissed bamboo toothbrushes as something only the crunchiest of hippies would use, but it turns out I was so, so wrong. Traditional toothbrushes are made entirely of plastic – from the handle to the bristles. Not only does that plastic end up in the landfill, but the toxins end up in your body by way of your mouth. So I threw out my plastic toothbrush and bought this bamboo one from Bass. It uses eco-friendly bamboo for the handle and nylon for the bristles. Plus it looks amazing on my bathroom vanity. Salt Toothpaste // Weleda’s Salt Toothpaste uses 100% natural sea salt to gently clean teeth, remove stains and get rid of tartar buildup. It also contains myrrh and ratanhia to tighten and restore circulation to the gums. Since it contains salt, I wasn’t expecting it to taste as great as it did (it’s actually pretty tasty). But I love how sparkly clean it made my teeth feel – like I had just left the dentist’s office. Activated Charcoal and Probiotic Toothpaste // I love probiotics and activated charcoal, so this toothpaste was a must. Activated charcoal has been used for ages to whiten teeth and remove stains. And probiotics restore beneficial bacteria to your mouth. I’m a huge coffee and tea drinker, but I noticed that my teeth looked a lot whiter after just a couple of uses. And my husband commented on how great my breath smelled after using it, which I chalk up to the probiotics. 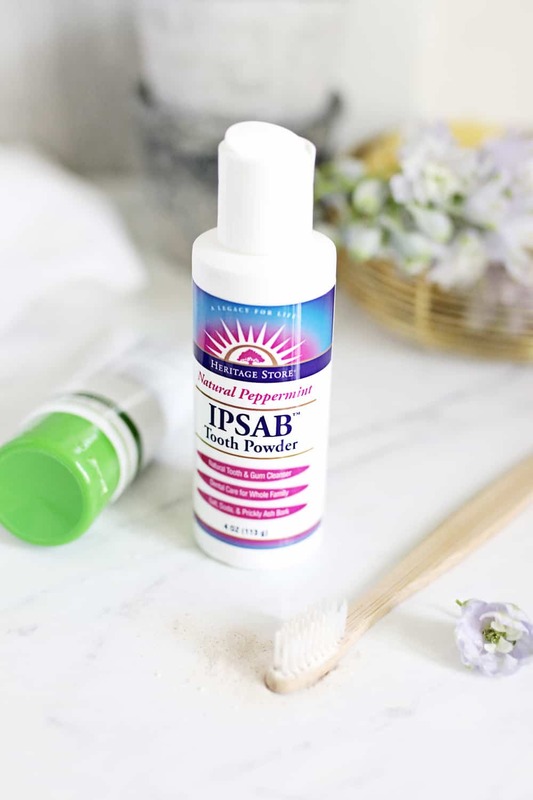 Tooth Powder // Most of us are used to traditional toothpastes, but this IPSAB Tooth Powder is a great, long-lasting alternative. It’s a combination of salt, soda, and prickly ash bark that gently cleans teeth without the use of water (uh-mazing if you travel a lot). Just sprinkle some on your toothbrush, brush as normal, then spit out. Mineral Mouth Rinse // One of the problems with traditional oral hygiene products is that they don’t help replenish the nutrients in your teeth and gums. That’s where a mineral mouth rinse like this one from ConcenTrace comes in handy. 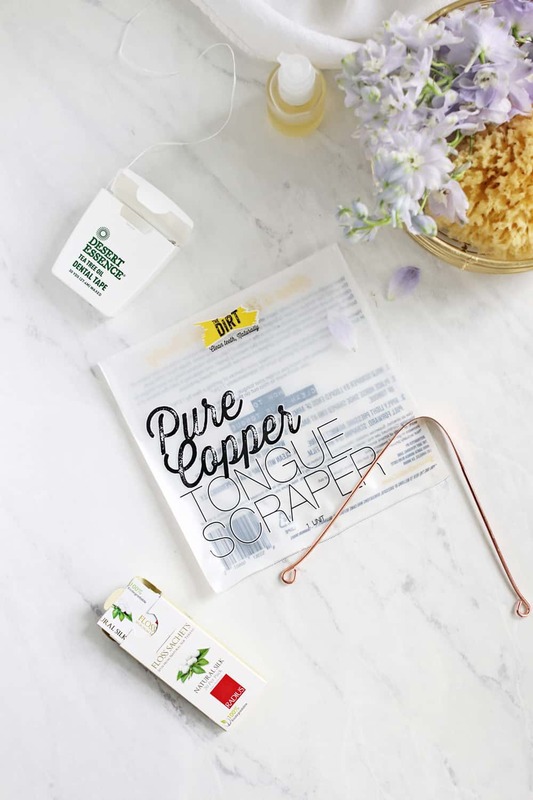 It contains sea salt, colloidal silver, and essential oils to help restore trace minerals and nutrients in the mouth. While I definitely can’t speak for everyone, I noticed less sensitivity after using it and it leaves my mouth feeling so fresh and clean. Natural Silk Floss Sachets // No matter how you cut it, traditional dental floss is bad for the environment. It’s heavy on packaging, not biodegradable, and a choking hazard for wildlife. But these Natural Silk Floss Sachets change all that. They’re made of natural silk thread instead of wasteful plastic. Plus they come in individually wrapped packages so you can use them on the go. And did I mention they’re 100% biodegradable? I always carry a few in my purse or travel bag for dental emergencies. Tea Tree Oil Dental Tape // While this floss from Desert Essence isn’t as environmentally friendly as the natural silk sachets, it is great for your teeth and gums. Tea tree oil is naturally antibacterial, so it kills germs lurking in your gums. And it’s slightly thicker than traditional floss, so it doesn’t shred and get stuck between your teeth (a flossing party foul). Tongue Scraper // This is a new one for me, but since I started using it, I’m a total convert. Unlike brushing and flossing, tongue scraping helps remove toxins and bacteria from your tongue, getting rid of bad breath and decreasing the likelihood of cavities. Starting in the back of your mouth, pull the scraper forward two or three times until your tongue looks clean and the film has been removed. Repeat once a day. 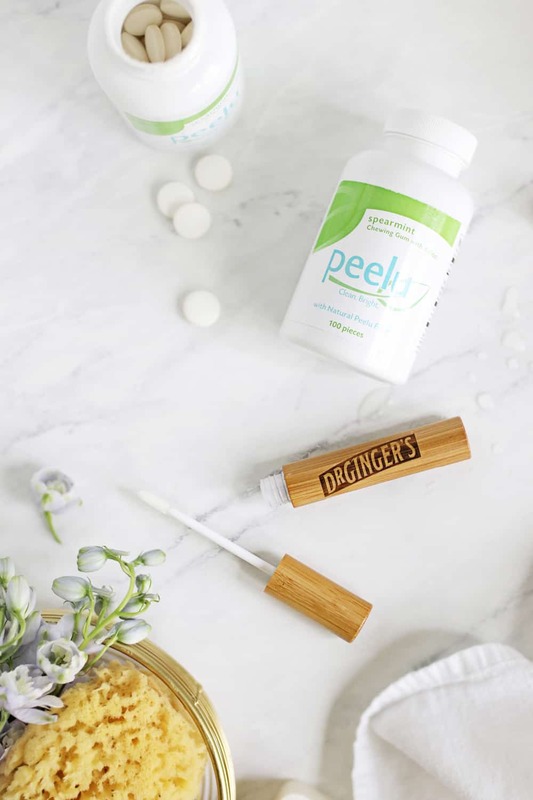 Peelu Chewing Gum // When it comes to natural teeth whitening, sometimes you have to keep at it to see results. Since I don’t have tons of time to whiten every day, I like products that do it for me. Peelu Chewing Gum uses peelu fiber to “scrub” teeth, keeping them clean and bright. I’m not usually much of a gum chewer, but I chew this stuff almost constantly throughout the day. The flavor lasts for a really long time and it makes my teeth feel like I just brushed ‘em. Coconut Oil Whitening Pen // This is another easy-to-implement way to get whiter teeth. Just brush Dr. Ginger’s Coconut Oil Whitening Pen on twice a day and let it dry. The coconut oil and hydrogen peroxide naturally remove stains, brighten teeth, and improve gum health. While more subtle than traditional whitening agents, I love that it removes stains without causing sensitivity and gum pain. 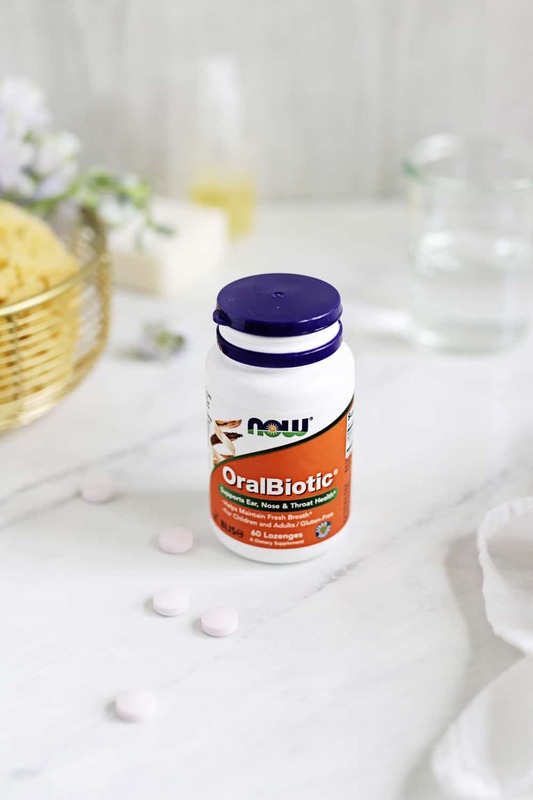 OralBiotic // Probiotics aren’t just for your stomach. Now Foods OralBiotic lozenges are an all-around wellness supplement for your mouth. They’re chock full of probiotics and enzymes that colonize your ear, nose, throat and mouth. Over time they help improve mouth health and maintain the body’s natural defense system. I noticed a huge improvement in my in-between-brushing breath from day one, so now I use them to keep my mouth fresh when I can’t get to a toothbrush. New customers can save money on their first order by using this link. Plus, save an additional $5 if you spend $40 by using the code WELCOME5 at checkout.